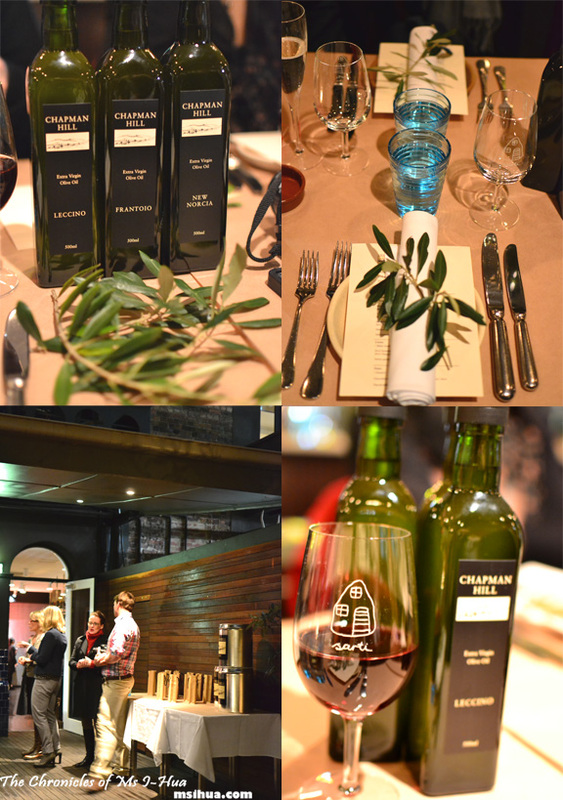 A few weeks ago, I received an invitation to attend Chapman Hill’s new season launch of their 2012 Extra Virgin Olive Oil varieties to be held at Sarti in Melbourne CBD. The last time I encountered Sarti was during the Taste of Melbourne 2011 where we had a Slow Cooked Suckling Lamb dish. My interest was piqued as this was marketed as you would a wine dinner and I wanted to attend to see for myself how a launch for Olive Oil would be. As I arrived, we were greeted by the friendly and engaging Chapman Hill owners, Ross and Sarah along with their two sons Hugh and Jock (who I must say were amazing at remembering everyone’s names!). They took turns in speaking with their guests about their estate, their products and their passion for what they do. You wouldn’t know it, but Ross and Sarah are actually in the wool, sheep and cattle industry and it wasn’t until 1999 that they realised that the slopes of Chapman Hill were ideal for growing olive trees and producing premium extra virgin olive oil (EVOO). 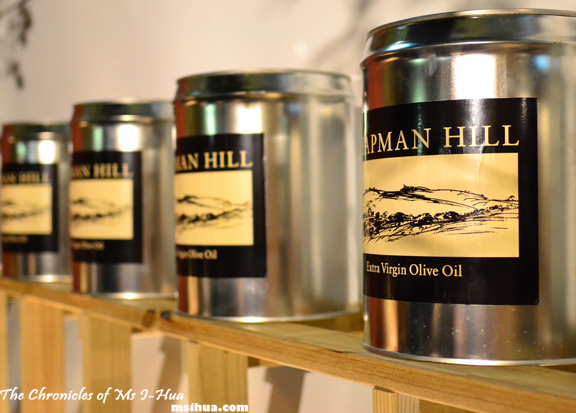 We were there, as I mentioned to celebrate the new season launch of EVOO from Chapman Hill. How does one go about an EVOO tasting? We were informed that we should go around the circle of strategically placed Olive Oil, but as we didn’t want to disrupt conversation flows of others gathered around the tasting tables, Azz, Sarah and I started with the 2012 Chapman Hill New Norcia EVOO followed by the 2012 Chapman Hill Leccino and 2012 Chapman Hill Frantoio. I know it may sound silly to try and write this as I would a wine tasting, but there were definitely distinct notes from all three EVOO. The Leccino would be the strongest and most “masculine” and the most bitter of the three and the lightest would be the New Norcia. The Frantoio was a nice balance of the two and had a mild peppery after taste to it as well. We weren’t “allowed” any alcohol beforehand lest it gets in the way of our EVOO tasting. Soon we were escorted to our seats and treated to a couple of wines, which I shall only briefly mention. We started with the 2011 Are You Game? Chardonnay followed by the 2010 Stone Dwellers Pinot Noir (which was very fruity for a Pinot Noir) and the 2009 Are You Game? Shiraz (which was sharp on the palate with a mellow aftertaste). All of our courses were made to share and we began with some lovely olives from Chapman Hill, which had that lingering bitter aftertaste as did the EVOO. The risotto balls were so rich and crispy they made my day. Such a lovely texture on them. I really liked the baked eggplant as well which was topped with breadcrumbs, napoli sauce and ricotta cheese. Not pictured is the Marinated Giardineira, House Made Capocollo, which had Mt Macedon pine mushrooms, cauliflower on cured pork neck (which was a bit salty) to match with the Leccino EVOO. For the Carne [Meats] we had a rather amazing and generous portion of Slow Braised Lamb, Artichokes, Buffalo Mozzarella (matched with Frantoio EVOO). The lamb from the Chapman Hill farm was extremely tender and rich. 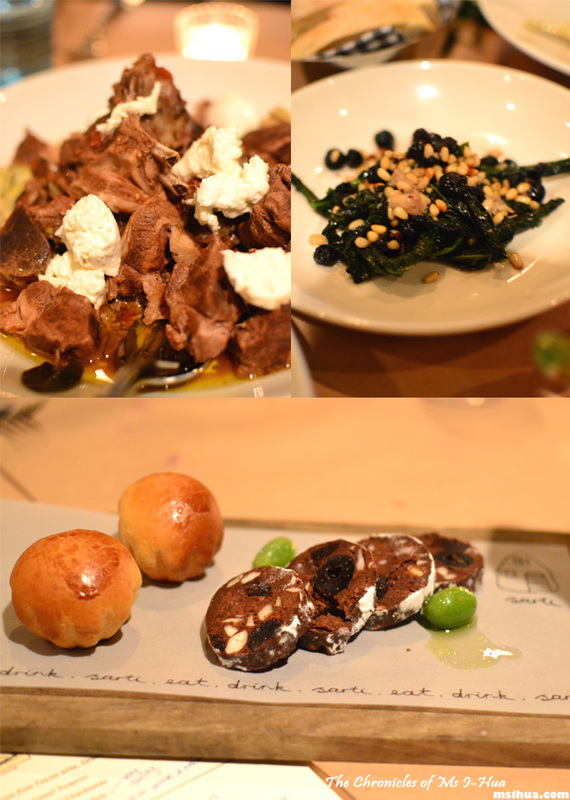 We were also served a side of Italian greens which were Tuscan Black Cabbage Sauteed with Pine Nuts, Blueberries and Cavolo Nero. I really really liked the addition of blueberries into this veggie dish and will now think of mixing my fruits and veggies more in salads! So good! All too soon, it was Dolci [Dessert] time! We had the curious Chocolate and Amarena Salami, Marzipan and Pistachio ‘Olive’ served with fluffy brioche balls. The amarena salami were made from cherries and macadamia nuts. I had a really good time at Sarti, which I’d never been before and I learnt quite a lot about Olive Oil that I didn’t know before! Who knew that one could have a shot glass of Olive Oil for tasting? Lol olive oil by the shot-glass hrmmmmm sounds interest but I’m game!!! Super cute and super yum with the chocolate! 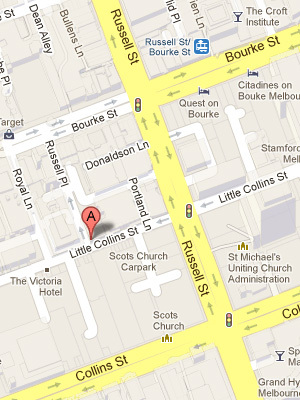 You and Agnes are getting whisked off everywhere in Melbourne for free right now!! SWISH at life! EVOO is the best thing ever! 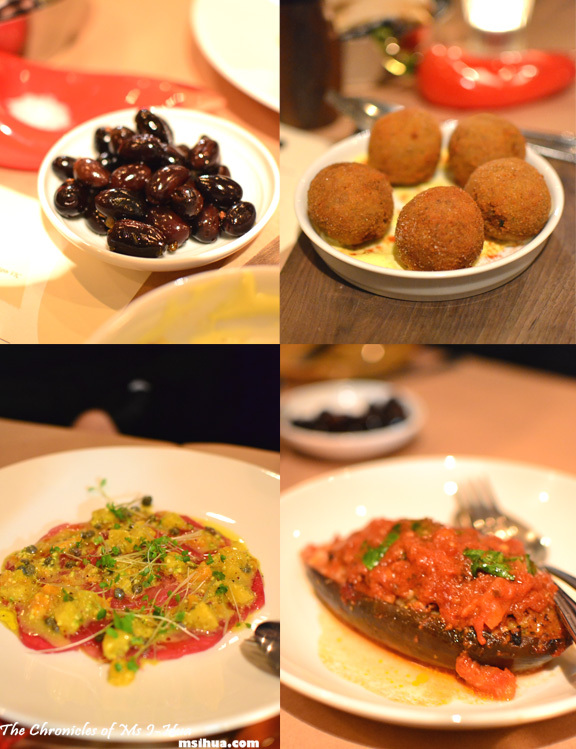 Sarti is a lovely place to have dinner but for some reason, I never got around to blogging about my experience and because it was ages ago, I don’t really feel like it haha. Gives me an excuse to go again, though! Any excuse to dine is a good excuse I say!